Twitter is the first place people go to for customer service. Sometimes it’s about having complaints addressed and questions answered, and other times it’s about saying thank you for great service or getting help with a really pressing issue. Twitter has changed the dynamics of customer service by not only encouraging interaction, but by enabling brands and customers to quickly connect –– often with hilarious results. To find out more about, Research Now conducted research on behalf of Twitter that looked into the reasons for all of this as well as the impact on brands. Our research found that 61% of Twitter UK users surveyed admit that the public nature of Twitter affects what they Tweet about brands. For users, Twitter feels like the right environment to discuss customer service queries with brands. And not only with brands, but with other customers who may be experiencing similar issues. It’s an example of how Twitter transforms the customer service experience from a 1:1 interaction to a 1:many. What makes customer service on Twitter so widespread is that it is used by brands from all sectors. From finance, to retail, travel and telecoms. However, there are some sectors that are more active than others. 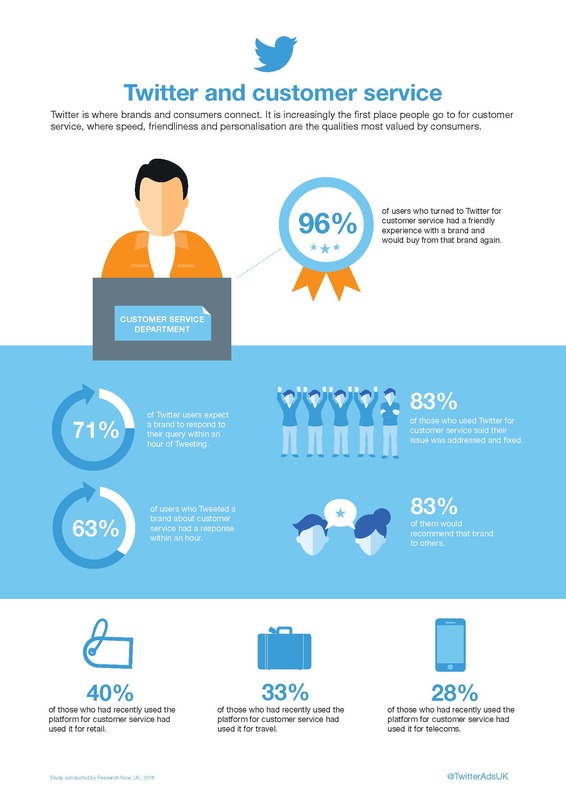 Our research found that users are most likely to use Twitter as a customer service channel for retail and travel. As many as 40% of those who had recently used the platform for customer service had done so for retail; 33% for travel and 28% for telecoms. Another study we ran in conjunction with TNS explored the impact of customer service on Twitter for telco brands. Unsurprisingly, those who had a response from a brand had almost 3x higher brand preference than those who hadn’t and were also more likely to recommend that telco brand. For telco brands, customer service interactions are an opportunity to strengthen relationships with their customers. As many as 42% of telco Tweets consisted of requests for more information or questions, representing a key moment for brands to strengthen ties with their customers. A further 27% Tweeted at telco brands to extend, alter or sign a contract with them(2). What users really want from a customer service interaction on Twitter is their problem solved. And the great thing is that Twitter is very good at making this happen. As many as 83% of those who used Twitter for customer service said their issue was addressed and fixed(3). Twitter is about what’s happening now. That means when it comes to customer service, users expect brands to respond quickly. Our research found that 24% of users ranked speed as the most important attribute for customer service on Twitter, while a quarter agreed that it’s important(4). We found that 71% of Twitter users expect a brand to respond to their query within an hour of Tweeting. For many companies that is not proving an issue. Our study showed that 63% of users who Tweeted a brand about customer service had a response within an hour. In fact, over a third of them had a response within 30 mins(5). Overall, 80% of those who used Twitter for customer service were responded to, and in fact 80% were satisfied with the customer experience on Twitter(6). Other important factors cited by users were when it comes to customer service on Twitter are friendliness and personalisation. When brands build this into their Twitter customer service, the results are often positive. How brands perform on Twitter impacts how users feel about them. Two thirds of users say their opinion of a brand would be improved if that brand responded to a Tweet(7). For brands, the dividends of delivering great customer service on Twitter can be really valuable. It drives and builds customer loyalty. Our study found that 96% of users who turned to Twitter for customer service and had a friendly experience with a brand would buy from that brand again. Equally important, an impressive 83% of them would recommend that brand to others. We see a similar impact when it comes to personalisation too. Those figures show how great customer service can contribute to the bottom line. This is borne out by a recent study we conducted in the US, which found that customers were willing to pay nearly $20 more to travel with an airline that had responded to their Tweet in under six minutes. When they got a response over 67 minutes after their Tweet, they would only pay $2 more to fly with that airline(8).